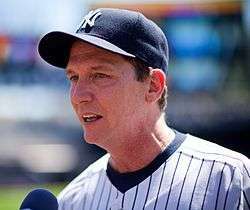 David Brian Cone (born January 2, 1963) is an American former Major League Baseball (MLB) pitcher, and current color commentator for the New York Yankees on the YES Network. A third round draft pick of the Kansas City Royals in 1981 MLB, he made his MLB debut in 1986. During a 17-year baseball career, he pitched until 2003 for five different teams. Cone batted left-handed and threw right-handed. Cone pitched the sixteenth perfect game in baseball history in 1999. On the final game of the 1991 regular season, he struck out 19 batters, tied for second-most ever in a game. The 1994 Cy Young Award winner, he was a five-time All-Star and led the major leagues in strikeouts each season from 1990–92. A two-time 20 game-winner, he set the MLB record for most years between 20-win seasons with 10. He was a member of five World Series championship teams – 1992 with the Toronto Blue Jays and 1996, 1998, 1999 and 2000 with the New York Yankees. His 8–3 career postseason record came over 21 games and 111 innings pitched, with an earned run average (ERA) of 3.80; in World Series play, his ERA was 2.12. Cone is the subject of the book, A Pitcher's Story: Innings With David Cone, by Roger Angell. Cone was born in Kansas City, Missouri to Joan (née Curran) (1936-2016) and Edwin Cone (b. 1934). He attended Rockhurst High School, a Jesuit school, where he played quarterback on the football team, leading them to the district championship. He played summer ball in the Ban Johnson League. At 16, he reported to an invitation-only tryout at Royals Stadium and an open tryout for the St. Louis Cardinals. Upon graduation, he was drafted by his hometown Kansas City Royals in the third round of the 1981 Major League Baseball draft. Cone went 22–7 with a 2.21 earned run average in his first two professional seasons. He sat out 1983 with an injury, and went 8–12 with a 4.28 ERA for the Double-A Memphis Chicks when he returned in 1984. During his second season with the Class AAA Omaha Royals (1986), Cone was converted to a relief pitcher, and he made his Major League debut on June 8, 1986 in relief of reigning Cy Young Award winner Bret Saberhagen. He made three more appearances out of the Royals' bullpen before returning to Omaha, where he went 8–4 with a 2.79 ERA. He returned to Kansas City when rosters expanded that September. Prior to the 1987 season, Cone was traded with Chris Jelic to the New York Mets for Ed Hearn, Rick Anderson and Mauro Gozzo. Cone went 5–6 with a 3.71 ERA and 68 strikeouts in 21 appearances (13 starts) his first season in New York City. Cone began the 1988 season in the bullpen, but was added to the starting rotation by the first week of May. His first start was a complete game shutout over the Atlanta Braves, as he went 9–2 with a 2.52 ERA in the first half of the season to earn his first All-Star nod. For the season, Cone went 20–3 with a 2.22 ERA to finish third in National League Cy Young Award balloting. The Mets ran away with the National League East by fifteen games over the Pittsburgh Pirates, and were heavy favorites over the Los Angeles Dodgers, against whom they had a 10–1 record during the regular season, in the 1988 National League Championship Series. After providing the Dodgers with bulletin board material, they jumped on Cone for five runs in two innings in the second game of the playoffs to tie the series at a game apiece. After giving up the column, Cone came back with a scoreless ninth inning in a game three Met win and a complete game victory in game six; however, series MVP and 1988 Cy Young Award winner Orel Hershiser came back in game seven with the complete game shut out to lead the Dodgers to the 1988 World Series against the Oakland Athletics. Cone spent over five seasons in his first stint with the New York Mets, most of the time serving as the team's co-ace alongside Dwight Gooden while leading the National League in strikeouts in 1990 and 1991. In 1991, Cone switched from uniform number 44 to 17 in honor of former teammate Keith Hernandez. On August 30, he struck out three batters on nine pitches in the fifth inning of a 3–2 win over the Cincinnati Reds. He became the 16th National League pitcher and the 25th pitcher in Major League history to accomplish the three-strikeout half-inning. Cone tied a National League record on October 6, in the season finale, by striking out 19 rival Philadelphia Phillies batters in a 7–0, three-hit shutout at Philadelphia. His 19 strikeouts was the second-highest total ever recorded in a nine inning game just behind the 20-strikeout games recorded by Kerry Wood, Roger Clemens (twice) and Randy Johnson, and tying Tom Seaver's single-game club record, making the Mets the only team with two pitchers to achieve the feat. Cone was the lone Mets representative at the 1992 Major League Baseball All-Star Game, going 9–4 with a 2.56 ERA at the All-Star break. With a 56–67 record, and fourteen games behind the first place Pirates, the infamous "worst team money could buy" traded Cone to the Toronto Blue Jays for Jeff Kent and Ryan Thompson on August 27, 1992 after the non-waiver trading deadline. With Toronto, Cone was 4–3 with a 2.55 ERA and 47 strikeouts. Combined with the 214 strikeouts he had with the Mets, his 261 strikeouts led the major leagues and were a career high. Cone headed to the post-season for the second time in his career as the Blue Jays won the American League East. The Jays defeated the Oakland Athletics in the 1992 American League Championship Series, and the Atlanta Braves in the World Series, to give Cone his first World Series ring, and become the first Canadian team to win the World Series. For his part, Cone went 1–1 with a 3.22 ERA in the post-season. Cone returned to his hometown Kansas City Royals as a free agent for the 1993 season. Despite an 11–14 record, Cone had an impressive 1993, pitching 254 innings with a 3.33 ERA, or 138 ERA+. He improved to go 16–5 with a 2.94 ERA (171 ERA+) in the strike-shortened 1994 season to win the American League Cy Young Award, and finish ninth in MVP voting. Cone was a Major League Baseball Players Association representative in negotiations with Major League Baseball in events that surrounded the 1994 baseball strike. Four days after the strike ended, the Royals traded Cone back to the Blue Jays for Chris Stynes, David Sinnes and Tony Medrano. Cone was 9–6 with a 3.38 ERA for Toronto, however, the Jays were 35–47 and in fifth place when they struck a deal with the second place New York Yankees. On July 28, 1995, the Blue Jays sent Cone to the Yankees for Marty Janzen, Jason Jarvis and Mike Gordon. When the Yankees acquired Cone, they were on a six-game winning streak, though still trailing the Boston Red Sox for the division lead. The Yankees won the wild card the first season of the new three division, wild card format. In his third post-season, Cone won the first game of the 1995 American League Division Series against the Seattle Mariners, and left game five with the score tied at four. The Mariners won the game in extra innings to eliminate the Yankees from the playoffs. The Yankees re-signed Cone in the offseason to a three-year contract worth $19.5 million. Cone was 4–1 with a 2.02 ERA when he was diagnosed with an aneurysm in his arm in 1996 and went on the disabled list for the majority of the year. In his comeback start that September against the Oakland Athletics, Cone pitched a no-hitter through seven innings before he had to leave due to pitch count restrictions. Mariano Rivera allowed a single, ending the no-hit bid. The Yankees returned to the post-season for the second of thirteen consecutive seasons. After losing to the Texas Rangers in game one of the 1996 American League Division Series, and a no decision in the 1996 American League Championship Series, Cone came back in game three of the World Series against the Atlanta Braves with a six inning, one run performance to give the Yankees their first win of the Series on their way to their first World Championship in eighteen years. Cone went 20–7 in 1998, setting a Major League record for the longest span between twenty win seasons. Cone won the 1998 American League Division Series clinching game against the Rangers, the 1998 American League Championship Series clinching game against the Indians, and Game Three of the 1998 World Series against the San Diego Padres. Cone finished fourth in the AL Cy Young voting. He re-signed with the Yankees for the 1999 season for $8 million. He went 12–9 in 1999, pitching the sixteenth perfect game in baseball history on July 18 against the Montreal Expos. It is the last no-hitter to date by a Yankee, the only regular season interleague perfect game. Making the game even more remarkable was that it was "Yogi Berra Day" at Yankee Stadium. After a long feud with owner George Steinbrenner, Berra agreed to return to the stadium that day, and caught the ceremonial first pitch from fellow perfect game pitcher Don Larsen. Larsen could be seen smiling in the press box after the final out was recorded. After the perfect game, he seemed to suddenly lose effectiveness. It was the last shutout he would throw in his career. In 2000 he posted the worst record of his career, 4–14, while seeing his ERA balloon to 6.91, more than double his mark the previous year. 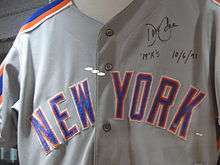 In spite of his ineffectiveness, Cone was brought in during game four of the 2000 World Series to face the Mets' Mike Piazza, a controversial decision at the time — Denny Neagle had given up a home run to Piazza in his previous at-bat, but was pitching with a lead and only needed to retire Piazza to go the minimum five innings to be eligible for a win. Cone induced a pop-up to end the inning. It was the only batter he faced in the entire Series. Cone recognized after the 2000 season that his tenure with the Yankees was over. In 2001 Cone pitched for the rival Boston Red Sox, performing with mixed but mostly positive results, including a 9–7 win-loss record and a 4.31 ERA. His 2001 season included a suspenseful 1–0 loss against Yankees ace Mike Mussina wherein Cone pitched 8 1⁄3 innings giving up one unearned run, keeping the game close even as Mike Mussina came within one strike of completing a perfect game, which would have made Cone the first pitcher to pitch a perfect game and be the losing pitcher in another. He sat out the 2002 season, but attempted a comeback in 2003. Cone went 1–3 in 4 starts for the Mets with a 6.50 ERA. He announced his retirement soon after his last appearance for the Mets on May 28, citing a chronic hip problem. Upon retiring from baseball in 2001, Cone became a color commentator on the YES Network during its inaugural season. However, his comeback attempt with the crosstown rival Mets in 2003 infuriated Yankees owner George Steinbrenner and Cone was told he would not be welcomed back. After his second retirement, Cone was offered a broadcasting position with the Mets, but opted to remain home with his family. His wife, Lynn DiGioia Cone, an interior designer whom he married in 1994, gave birth to a son, Brian, in 2006. David and Lynn Cone later divorced. Cone married real estate agent Taja Abitbol; they live in Greenwich Village and have a son, Sammy, who was born on December 15, 2011. In 2008, Cone rejoined the YES Network as an analyst and host of Yankees on Deck. He left the YES Network during the 2009–10 offseason in order to "spend more time with my family". He was replaced by former Yankees first baseman Tino Martinez. On April 19, 2011 Cone returned to the Yankees broadcast booth in Toronto, working as analyst for a Yankees-Blue Jays series along with Ken Singleton. As an announcer, he is known for making references to sabermetric statistics, referencing some websites such as Fangraphs.com. On July 17, 2009, Cone testified as a witness (representing the Democratic Party) before the Senate Judiciary Committee during the Supreme Court nomination hearings for Judge Sonia Sotomayor. Cone read a prepared statement in support of Sotomayor's nomination which chronicled Major League Baseball's labor dispute of 1994 and the impact of the judge's decision which forced the disputants back to the bargaining table. Cone said, "It can be a good thing to have a judge in district court or a justice on the United States Supreme Court who recognizes that the law cannot always be separated from the realities involved in the disputes being decided." His .606 won-lost percentage ranks 95th on MLB all-time list; 7.77 hits allowed per nine innings pitched ranks 60th on MLB's all-time list; 8.28 strikeouts per nine innings pitched ranks 17th; 2,668 strikeouts ranks 21st, and 419 games started ranks 97th on the MLB all-time list. New York Yankees all-time leader in strikeouts per 9 innings pitched (8.67). Holds New York Yankees single season record for most strikeouts per 9 innings pitched (10.25 in 1997). Is the last Yankee pitcher to strike out 200+ batters in two consecutive seasons. Is the only pitcher to have a 20-win season with both the Mets (1988) and the Yankees (1998). 1 2 Profile, yesnetwork.com; accessed February 14, 2015. 1 2 "David Cone Statistics and History". Baseball-Reference.com. Retrieved May 9, 2016. ↑ "Imperfect Games". Retrieved May 9, 2016. ↑ "Joan Cone 1936-2016". News-Press.com. Retrieved 21 October 2016. ↑ 27 Men Out. Retrieved May 9, 2016. ↑ "Minnesota Twins 5, Kansas City Royals 2". Baseball-Reference.com. June 8, 1986. ↑ "New York Mets 8, Atlanta Braves 0". Baseball-Reference.com. May 3, 1988. ↑ Joseph Durso (October 7, 1988). "THE PLAYOFFS; Troubled Cone Stops the Press". New York Times. ↑ "1988 National League Championship Series, Game Two". Baseball-Reference.com. October 5, 1988. ↑ Russ White (October 8, 1988). "Mets Pressure Cone To Drop Daily Column". Orlando Sentinel. ↑ "1988 National League Championship Series, Game Six". Baseball-Reference.com. October 11, 1988. ↑ "1988 National League Championship Series, Game Seven". Baseball-Reference.com. October 12, 1988. ↑ "New York Mets 7, Philadelphia Phillies 0". Baseball-Reference.com. October 6, 1991. ↑ "1992 Major League Baseball All-Star Game". Baseball-Reference.com. July 14, 1992. ↑ Bob Klapisch & John Harper (1993). The Worst Team Money Could Buy. Random House. ↑ John Ed Bradley (April 5, 1993). "Strikeout King David Cone Hopes the News He Makes as a Kansas City Royal Will be About Baseball, Not Off-the-Field Shenanigans". Sports Illustrated. ↑ Curry, Jack (July 29, 1995). "BASEBALL; A Day of Deals Bolsters Yankees' Pennant Hopes". The New York Times. 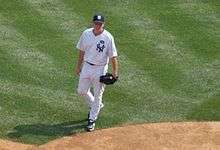 1 2 3 4 The David Cone Years, Riveraveblues.com; accessed February 14, 2015. ↑ "1995 American League Division Series, Game One". Baseball-Reference.com. October 3, 1995. ↑ "1995 American League Division Series, Game Five". Baseball-Reference.com. October 8, 1995. ↑ Curry, Jack (December 9, 1995). "BASEBALL;With No McDowell, The Focus Is on Cone". The New York Times. ↑ Curry, Jack (December 22, 1995). "BASEBALL;Cone Makes Up His Mind: 3 Years in Pinstripes". The New York Times. ↑ Curry, Jack (May 8, 1996). "BASEBALL;Cone Will Have Surgery to Remove an Aneurysm". The New York Times. ↑ "New York Yankees 5, Oakland A's 0". Baseball-Reference.com. September 2, 1996. ↑ "1996 American League Division Series, Game One". Baseball-Reference.com. October 1, 1996. ↑ "1996 American League Championship Series, Game Two". Baseball-Reference.com. October 10, 1996. ↑ "1996 World Series, Game Three". Baseball-Reference.com. October 22, 1996. ↑ Vecsey, George (October 23, 1996). "Credit Cone With a Save For the Series". The New York Times. ↑ Olney, Buster (November 12, 1998). "BASEBALL; Cone Signs One-Year, $8 Million Pact to Stay With Yanks". The New York Times. ↑ "David Cone's Perfect Game Boxscore". Baseball-Reference.com. July 18, 1999. ↑ Chass, Murray (July 19, 1999). "BASEBALL; On Day Made for Legends, Cone Pitches Perfect Game". The New York Times. ↑ "A mid-summer dream". CNN. July 16, 2007. Archived from the original on June 28, 2011. ↑ "Most Recent No-Hitters, By Team", Sports Illustrated, June 11, 2003. ↑ Baseball Video Highlights & Clips: 7/18/99: David Cone's Perfect Game – Video, MLB.com; accessed February 12, 2015. ↑ Torre, Joe; Verducci, Tom. The Yankee Years. New York: Doubleday Publishing. pp. 74–75. ISBN 978-0-385-52740-8. ↑ Anderson, Dave (October 29, 2000). "Sports of The Times; Cone Is Given a Moment to Cherish". The New York Times. ↑ "200 World Series, Game Four". Baseball-Reference.com. October 25, 2000. ↑ Olney, Buster (December 8, 2000). "BASEBALL; No Longer King of the Hill, Cone Departs". The New York Times. ↑ "Hip Problem Forces Mets' Cone to Retire". Los Angeles Times. May 31, 2003. ↑ Smith, Chris (October 18, 1999). "Wild Pitcher". New York Magazine. Retrieved May 14, 2012. ↑ Harper, John (June 25, 2006). "Inside Scoop: Cone Loyalty Torn. Pinstripes Still Suit Him, But So Do Mets". New York Daily News. Retrieved May 14, 2012. ↑ David Cone to buy apartment at Greenwich Lane, nypost.com; accessed February 12, 2015. ↑ Mushnick, Phil (January 8, 2010). "Cone leaving YES Network". The New York Post. ↑ David Cone on Advanced Stats, the End of His Playing Career, and Riding on David Wells's Motorcycle, nymag.com; accessed February 12, 2015. ↑ Senate Judiciary Committee website; accessed February 12, 2015. ↑ Around, Voices (July 16, 2009). "Live Blogging Sotomayor Hearings, Day 4". The New York Times.